“Our Politbiuro of the Central Committee is the organ of operational leadership for all branches of socialist construction,” noted Lazar Kaganovich in his report to the Seventeenth Party Congress in February 1934. It was this, but it was also more than this. 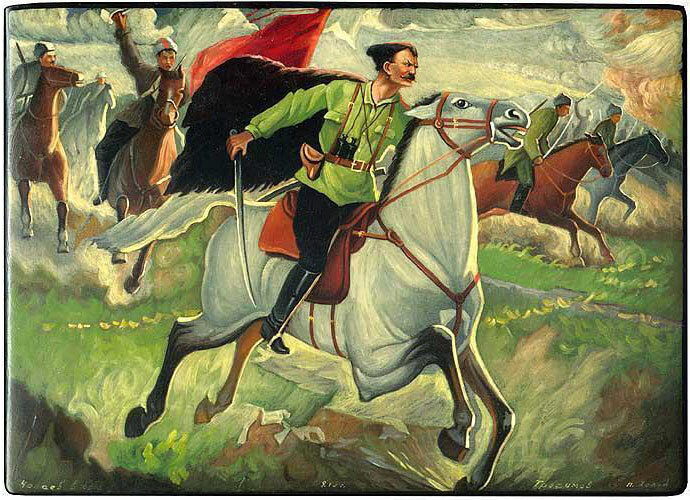 Established as a permanent body in 1919, the Politbiuro stood at the apex of the Soviet political system. 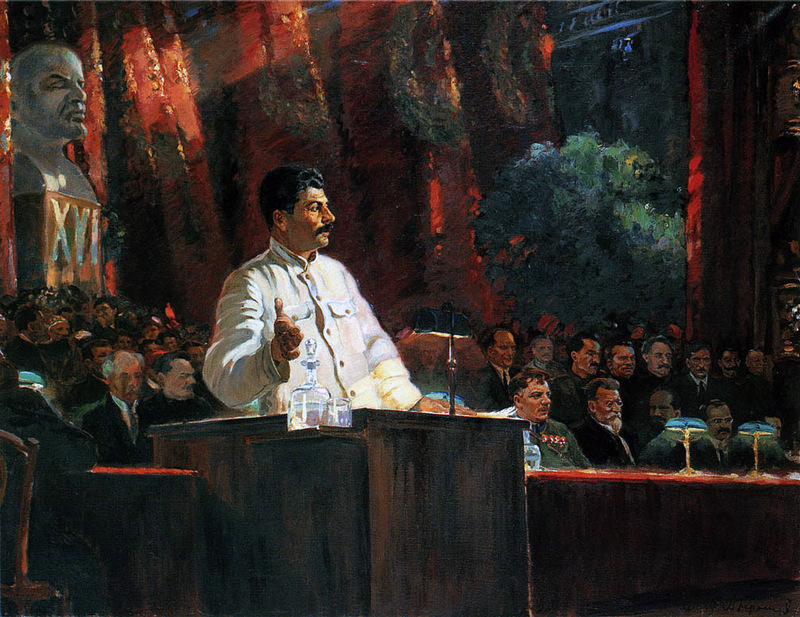 Formally elected by and responsible to the Central Committee, it deliberated on and resolved questions of both major and minor importance and frequently was the source of laws and decrees that appeared under the names of other bodies such as the Central Executive Committee of the Soviets, the Council of People’s Commissars, and the Council of Labor and Defense. The inner workings of the Politbiuro and in particular its relationship to Stalin’s unchallenged leadership have long been obscured by its secretiveness and the inaccessibility of its records. 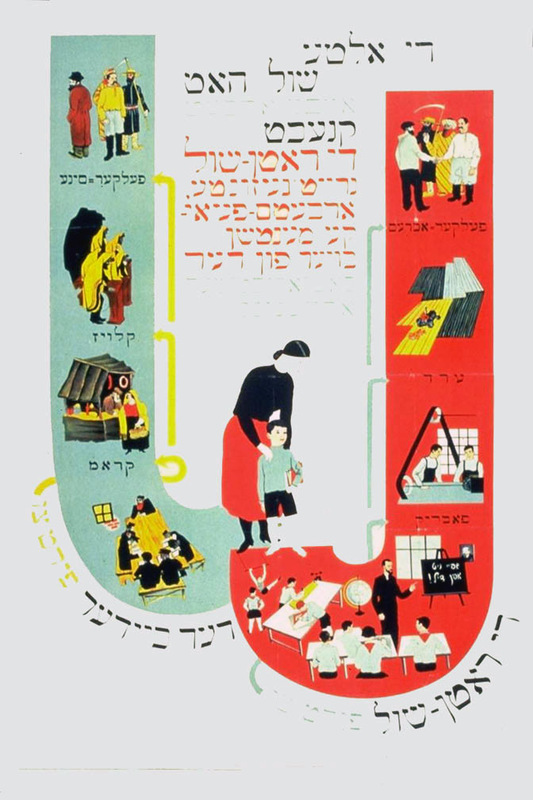 Much though has been learned in recent years as archival research has begun to lift the veil of secrecy. 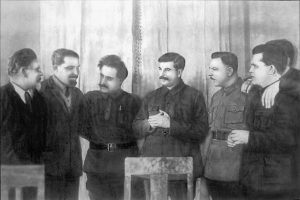 Initially composed of five full and three candidate members, the Politbiuro grew to seven full and four candidate members by the time of Lenin’s death in 1924. 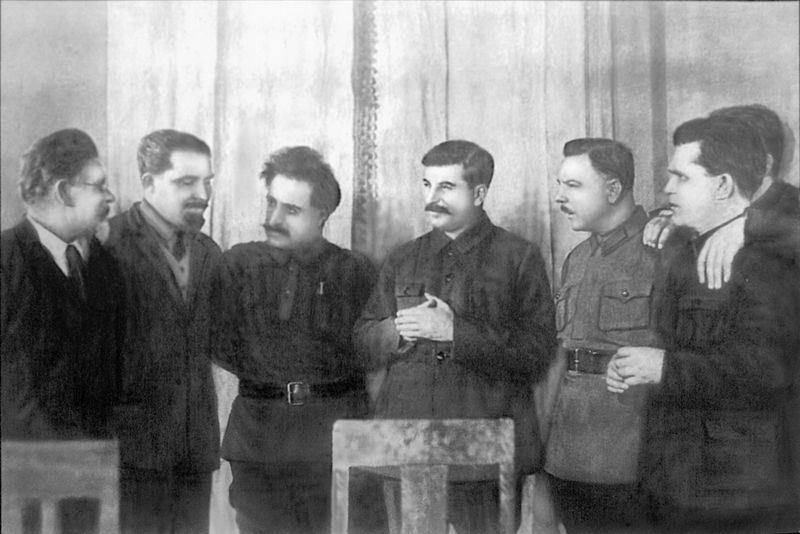 By 1927 after Trotsky’s removal, it contained nine full and eight candidate members. 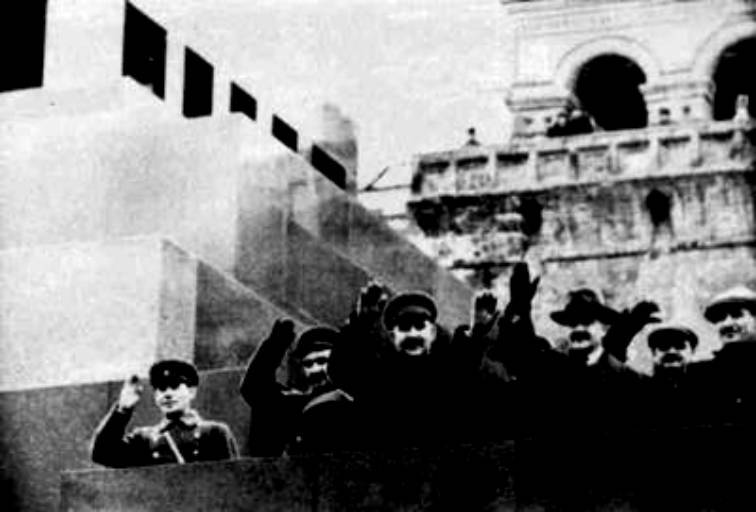 Both the Sixteenth Party Congress in July 1930 and the Seventeenth Congress in 1934 elected Politbiuros of ten full and five candidate members. These numbers declined to nine and two respectively after the Eighteenth Congress in 1939. Four individuals were full Politbiuro members throughout the years 1927 through 1941: Lazar Kaganovich, Mikhail Kalinin, Viacheslav Molotov, and, of course, Iosif Stalin. 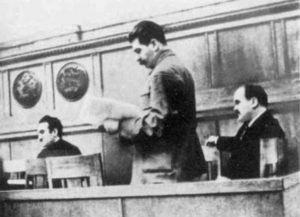 Kaganovich and Molotov presided over meetings of the Politbiuro in Stalin’s absence. From 1930 to 1936 the Politbiuro met on average forty-six times a year with a marked decline in the frequency of meetings after 1932. 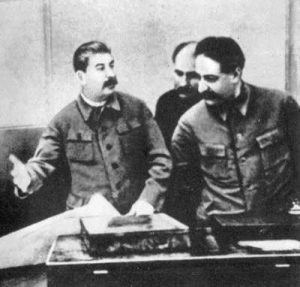 Protocols of its meetings indicate that an average of approximately three thousand items appeared on its agendas every year during the 1930s. 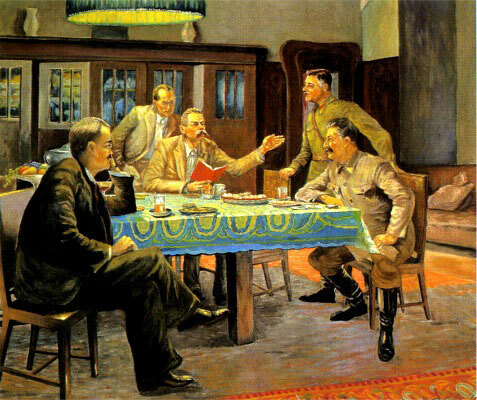 On April 14, 1937 the Politbiuro on Stalin’s initiative resolved to form two five-man standing commissions, one to prepare and “in case of especial urgency” to resolve questions of a secret character including foreign policy, and the other to deal with economic issues. Stalin, Molotov, and Kaganovich served on both commissions which functioned as inner circles that replaced the full Politbiuro during the next few tumultuous years. 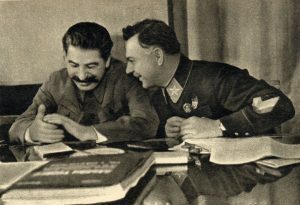 It is likely that after the removal from the Politbiuro of Ezhov and Chubar the two commissions merged, with Klement Voroshilov and Anastas Mikoian comprising the other two members. It long has been argued that even after the consolidation of Stalin’s power at the beginning of the 1930s there existed two factions within the Politbiuro: a moderate faction and a radical faction. 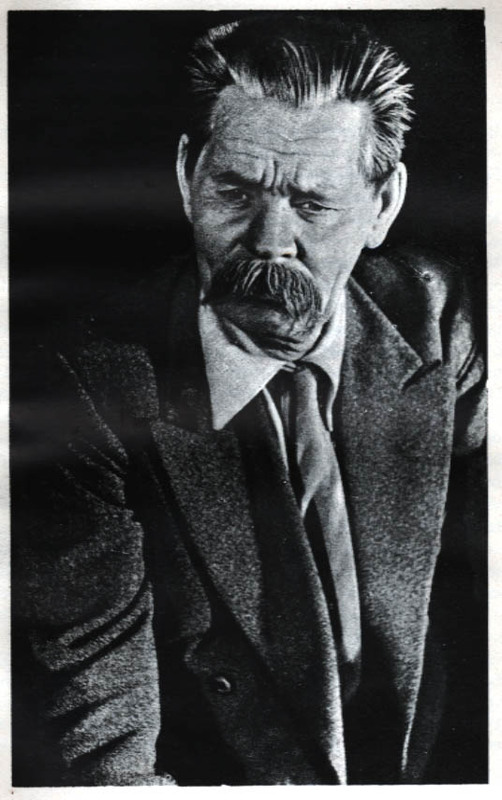 Frequently, Sergei Kirov is cited as the leader of the moderates, and his assassination in December 1934 is understood to have been engineered by Stalin with the support of the radicals. 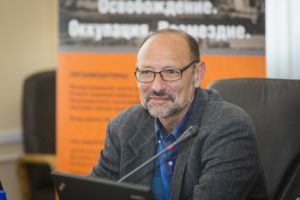 Still later, “Sergo” Ordzhonikidze is supposed to have tried to exercise a moderating influence particularly with respect to industrial policy and the purges. It now seems more likely, however, that while disagreements occurred frequently among members, no firm factions existed. 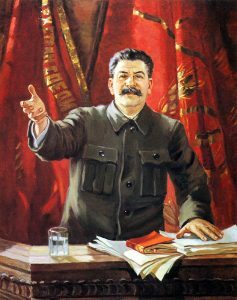 Some who were relatively “moderate” on certain issues were “radical” on others, and this includes Stalin. 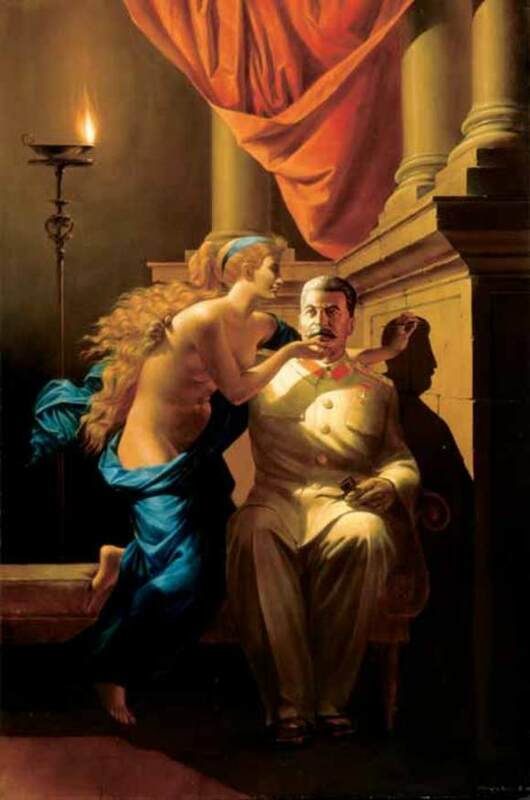 What is even more clear is that no issue of any importance was decided by the Politbiuro without Stalin’s participation, and certainly not against his will. 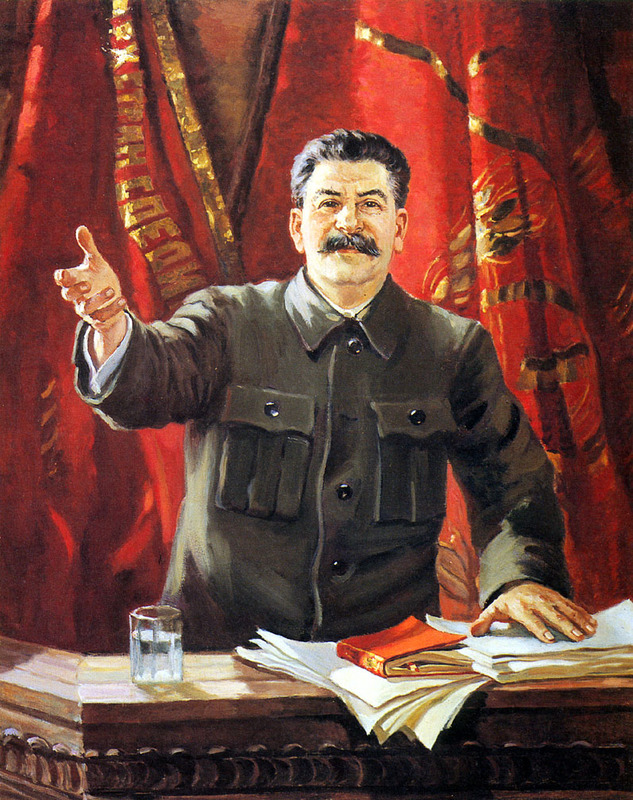 Assumptions that Stalin had staged Kirov’s assassination to eliminate someone whose popularity in the party was eclipsing his own and/or to have a pretext to launch a wave of terror within the party to assert his own dictatorial power long circulated among dissident party members and in the »migr» community. They were recycled by western historians in search of an explanation for the bloodbath that overwhelmed the party during 1936-38. Yet, at least two official investigations in the 1960s and a Politbiuro Commission appointed in 1989 failed to establish Stalin’s complicity or that of the NKVD in Kirov’s murder. 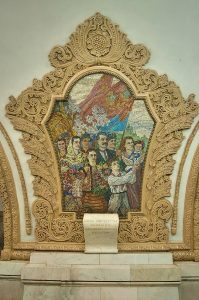 The assassination did churn up an atmosphere of heightened vigilance and political tension at all levels of the party. However, the link between it and what is known as the Great Terror seems more circumstantial than direct. 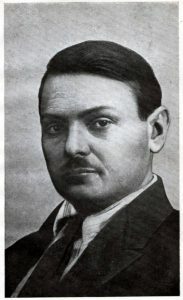 Kirov’s position was assumed by Andrei Zhdanov, a loyal follower of Stalin. 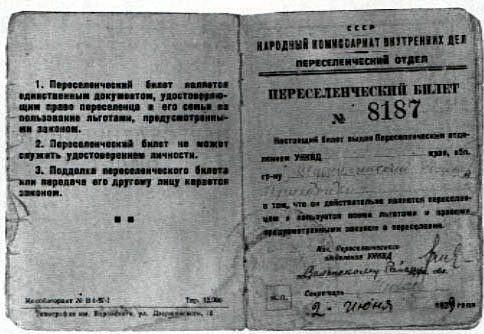 One byproduct of Kirov’s assassination were the reports by the NKVD on popular attitudes. 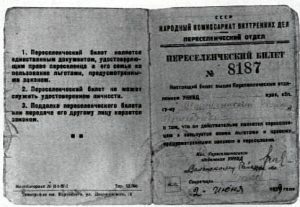 As analyzed by historians who recently gained access to them, they indicate that many people attributed the act to dark forces (in some versions, the Jews), looked forward to Stalin sharing the same fate, and were more concerned about the return of food shortages than the political fallout. Nevertheless, within the party, Kirov enjoyed martyr status, and his name was affixed to cities, streets, and such venerable institutions as the former Marinskii Ballet in Leningrad. The Kirov affair illustrates the power of rumor and legend in a society where reliable information was hard to come by. 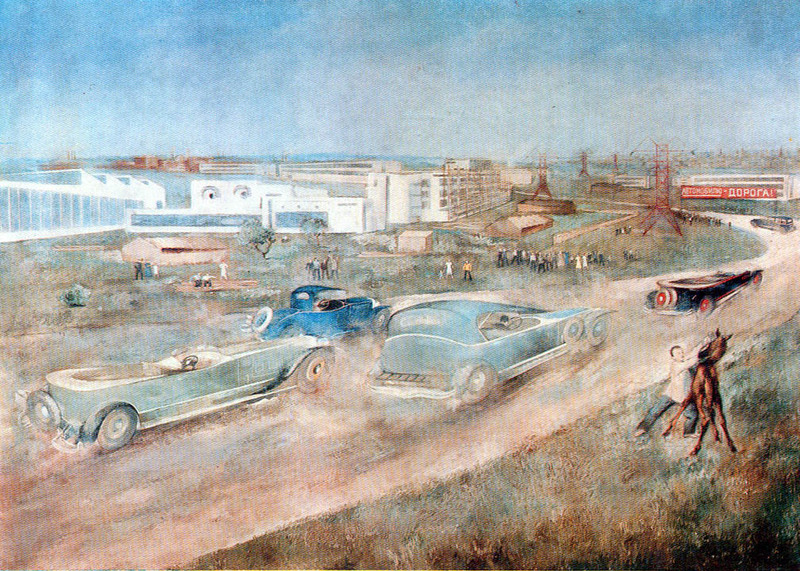 A modern city should have a modern transport system; and as the most modern of Soviet cities, Moscow received most modern conceivable system of transport in the year 1934. 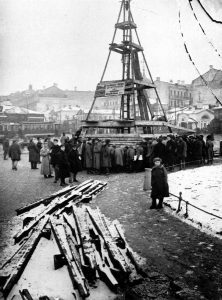 Under the direction of new Moscow Municipal Soviet chairman Nikita Khrushchev, a trolley system was built first. 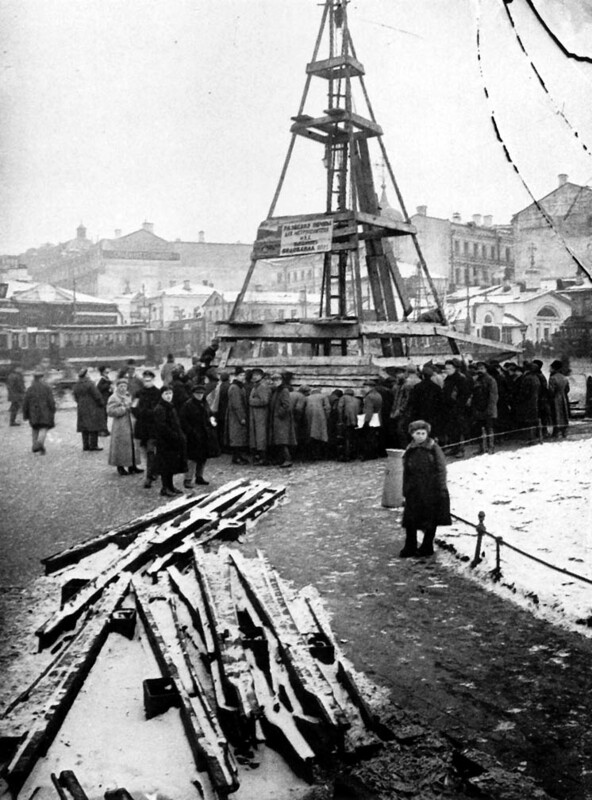 Although Stalin feared that the trolleys would all tip over, he was eventually convinced that the non-polluting electric motors would be the most efficient first project. 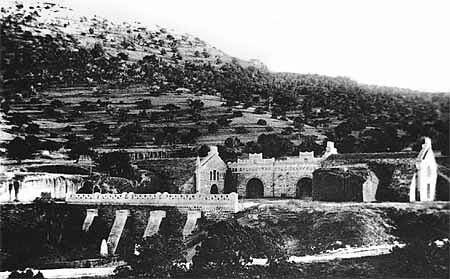 Upon completion, city leaders turned their attention to the metro, a project whose magnitude they did not fully understand. 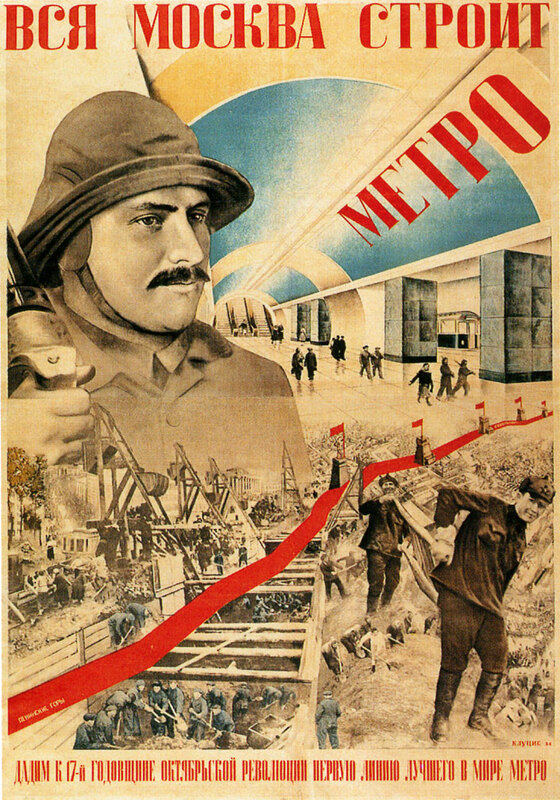 The publicity campaign that accompanied construction from 1932 guaranteed that the Soviet state would devote its full resources to the project. 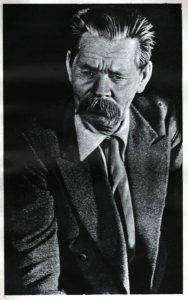 The reputations of several leading politicians were at stake, including Kaganovich and the younger Khrushchev. The directors took their initial models from German subway constructors, who dug with an open-pit method that ensured speed, but limited subway lines to already operating transportation routes, and wreaked havoc by closing off larges sections of the city. 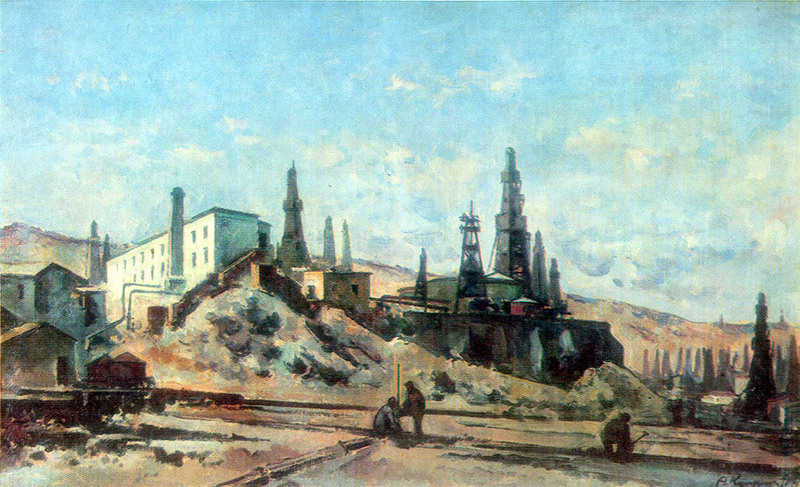 Eventually excavations developed during construction of the London subway system were adopted, calling for deep underground construction. Initial investments in equipment were massive, but Stalin approved them. 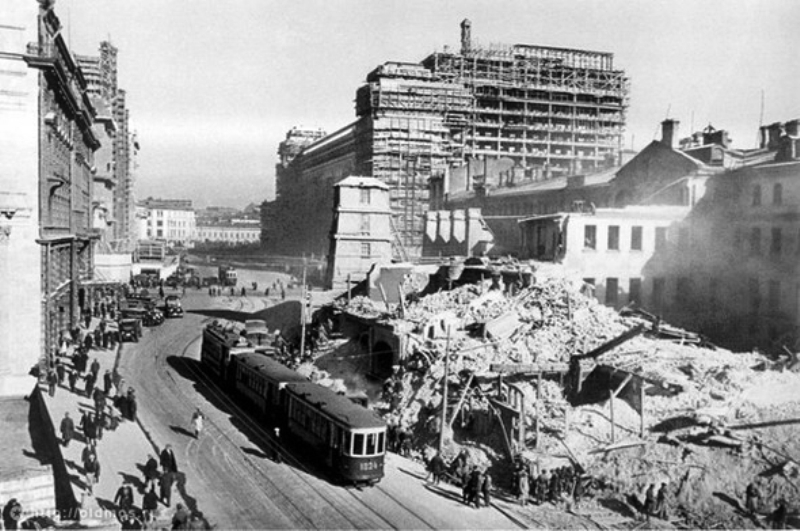 Construction no longer disrupted city life, and routes could cut all over the city, going under any existing structure. 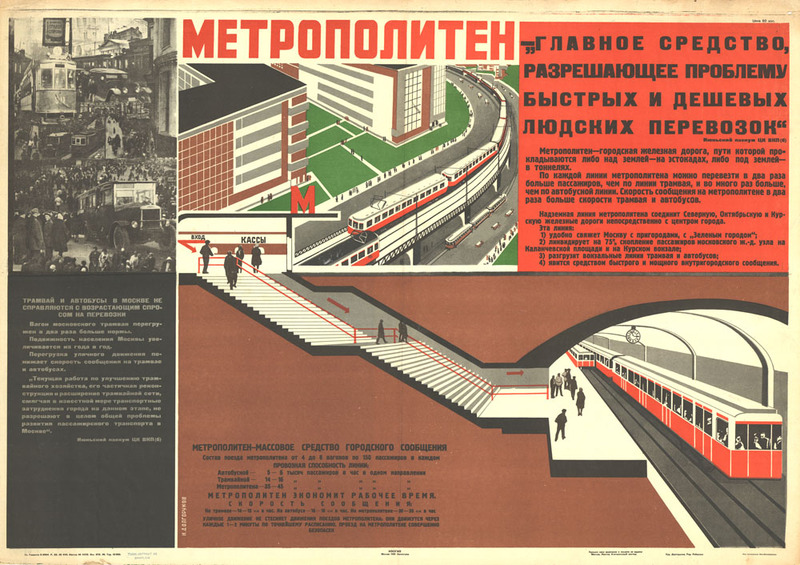 The elevators originally planned could not move foot traffic to the deep stations rapidly enough, and the new escalator technology was approved. 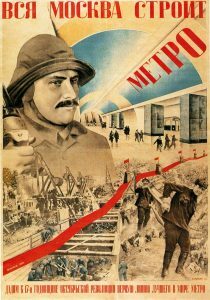 These decisions would prove extremely wise, as subway stations served as effective bomb shelters during the coming war; and the subway system has continued to expand easily until the present, allowing the city to grow. 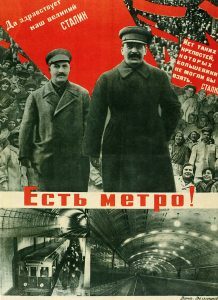 The subway system served as a showpiece for Stalin’s government, and rightly so. 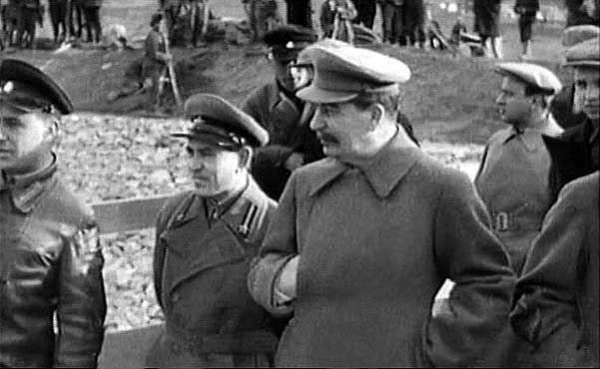 Managers dispatched by the party dealt with overwhelming obstacles, including the complexities of tunneling for miles under the earth, and a massive shortage of skilled labor. 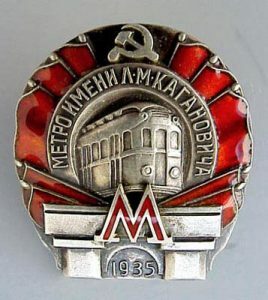 Yet the first line of the subway opening in 1935, and has continued to operate since as the finest system in the world. 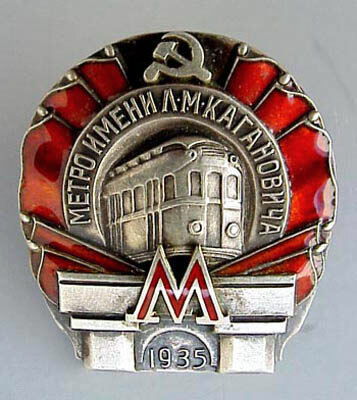 Initially named the L. M. Kaganovich Metropolitan System (outraging Khrushchev, who felt that he had done all the work), and later renamed for Lenin when Khrushchev purged Kaganovich in 1957, it demonstrated how effectively the socialist state could mobilize itself for great projects. 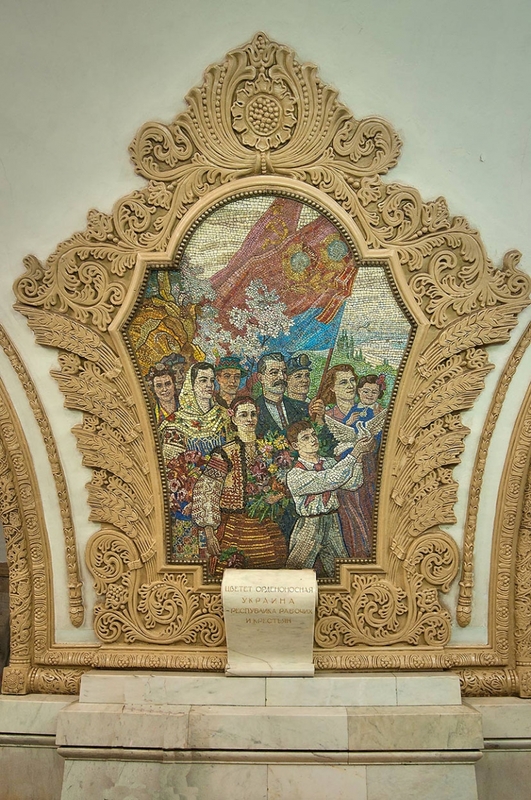 Stations in central Moscow are like palaces, walls clad in precious stone, decorated by mosaics and grandiose sculptures. 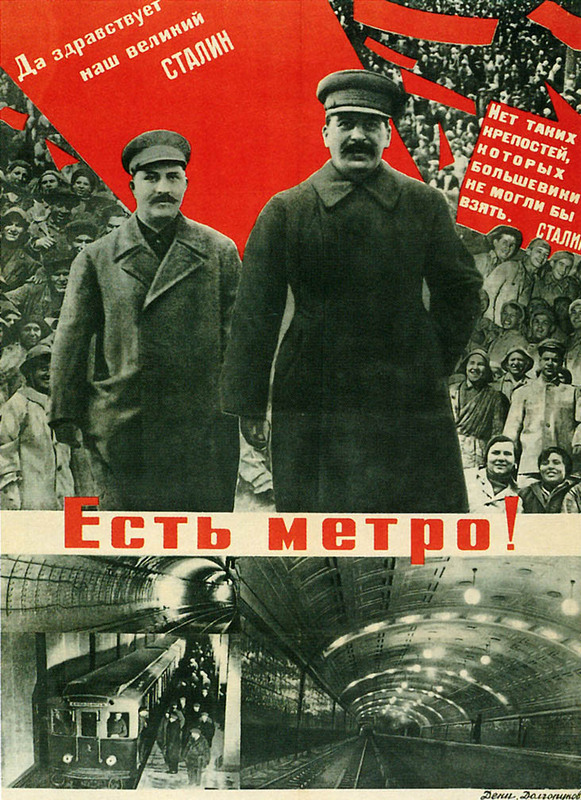 Tourists came from across the Soviet Union, even the world, to see its wonders; Muscovites used the subway to move about their great city. 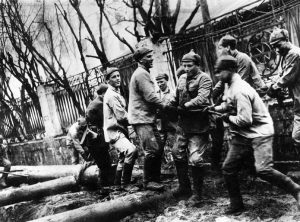 In time of war it saved them from German bombs; in finer times, it served young people as a place to meet and fall in love. 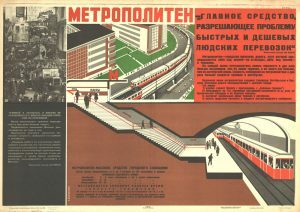 Although none of these things were mentioned in the original plans, they did great credit to the party that built the subway. 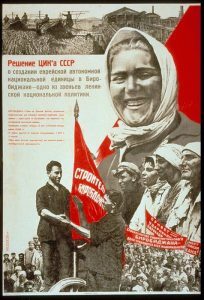 More proficient in producing films that parroted official values than at bringing mass audiences into the theater, the Soviet film industry shifted its agenda as it underwent organizational changes in the early 1930s. 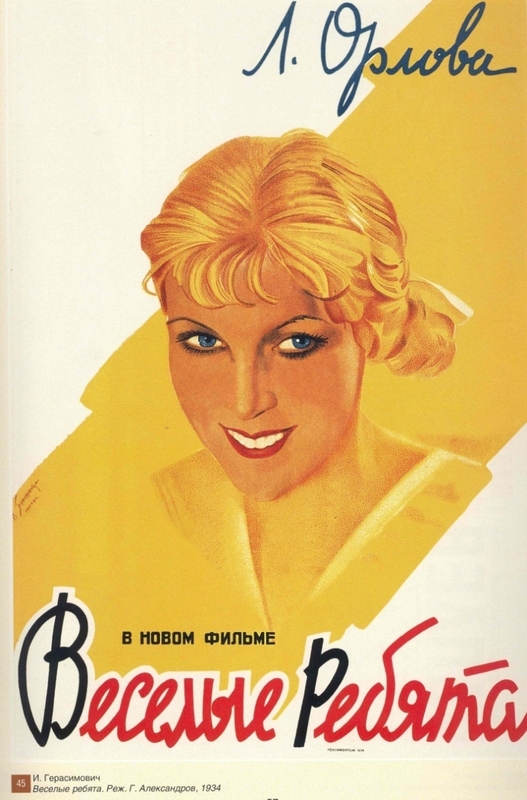 The industry was now coordinated by a new organization, Soiuzkino, responsible for the financing and production for films; and its new chairman, Boris Shumiatskii, took a much more aggressive role in shaping the aesthetics of Soviet film. His goal, dictated by the government, was to make the film industry self-financing. 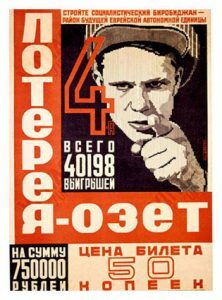 Tired of aesthetically ambitious films that confused the average Soviet viewer, Shumiatskii demanded films that were “accessible,” enjoyable and entertaining. 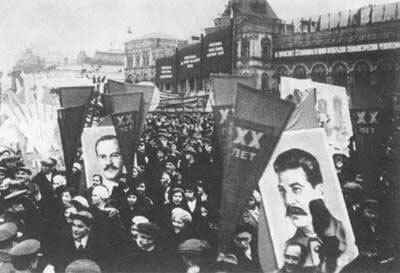 Although political fidelity was still a must, it soon became clear that politics would yield to fun as the primary mission. 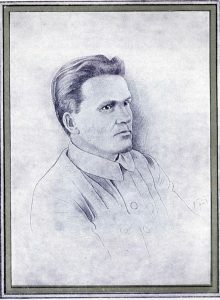 Shumiatskii dethroned the avant-garde kings of the cinema, foremost among them Sergei Eisenstein. 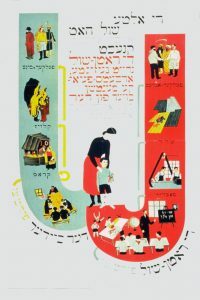 Complicated layers of bureaucracy controlled the creation of film scenarios, and commissioned the films based on them. 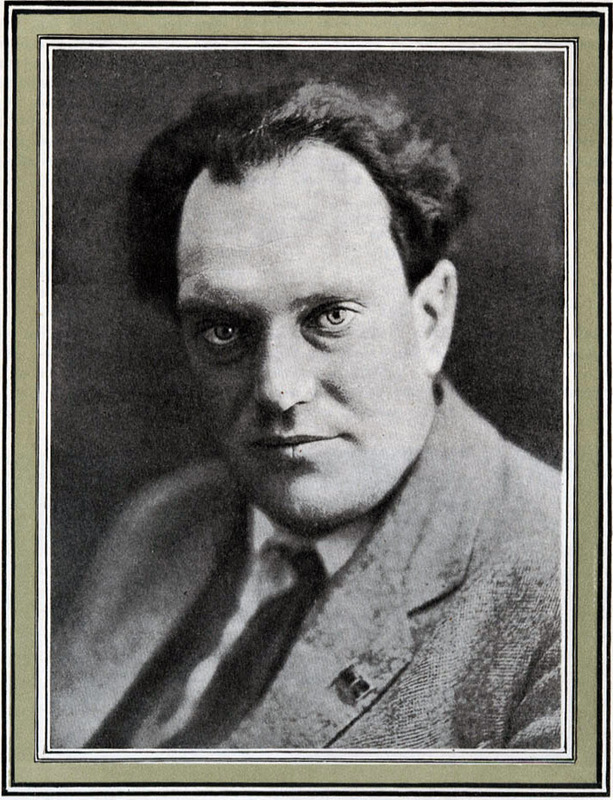 While Eisenstein and others found themselves stymied by the bureaucracy, other directors who could satisfy popular tastes found that the new system encouraged their work. 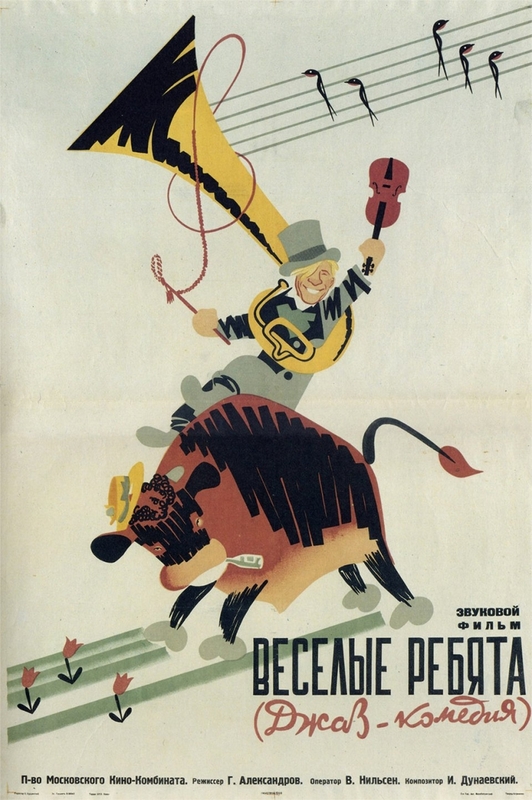 1934 was the year of the first smash hits with the Soviet audience. Two in particular are noteworthy: Happy-Go-Lucky Fellows , directed by Grigorii Aleksandrov, and the Vasiliev Brothers’ Chapaev . 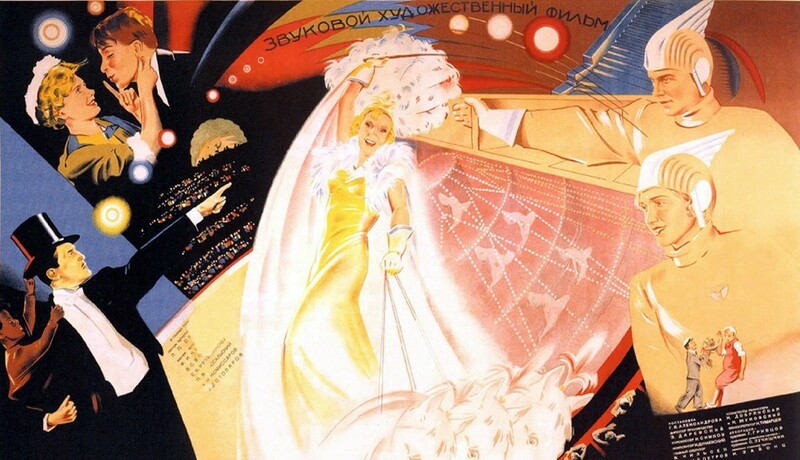 Once Eisenstein’s assistant director, who had traveled to Hollywood with the master in 1930-1932, Aleksandrov saw how the movie musical, using the new medium of the talking movie, could win a mass audience. He set to creating the Soviet musical, and selected as his lead man Leonid Utesov, one of the most popular singers of the 1920s and beyond, whose repertoire included the slangy songs of his native Odessa, and a strong admixture of jazz. 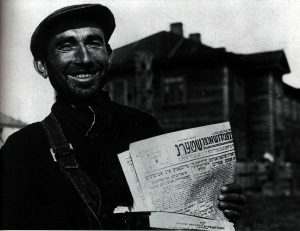 In the movie, Utesov plays a simple shepherd from the Crimean village of Abrau, whose singing talent is discovered by vacationing Muscovites. 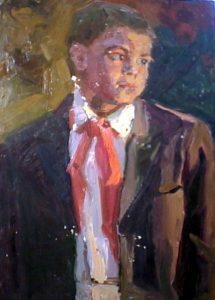 He is whisked away to the capital, and soon finds himself leading a jazz band whose antics do not impede their quick route to the top of the music business. Anybody, it seemed, could be a star in Soviet Russia. 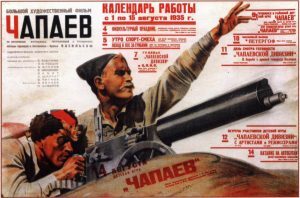 Although the political message of the movie was muted by the wonderful music, the other great hit of 1934 found its hero in one the Revolution’s great stories. 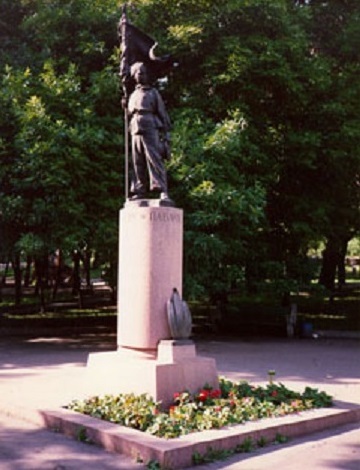 Chapaev was real-life hero, a simple soldier who rose to command in the Civil War. 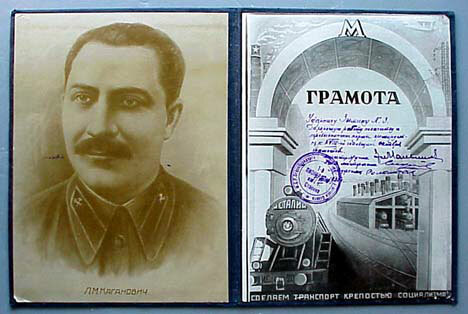 His life and death were glorified in a 1923 novel by Dmitrii Furmanov, who had served as commissar in his division. The film, based on the novel, told the story of how Chapaev, brave and charismatic but politically untutored, came to understand the Bolshevik cause he instinctively supported. Under the respectable guidance of his commissar, he taught his undisciplined troops the values of order, subordination, and the primacy of the cause over the individual. 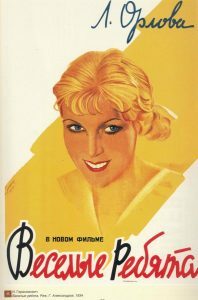 But it was the rough-cut personality of Chapaev, full of grand gestures and petty foibles, that was the main draw of the movie. Sketch for Stalin’s Speech at the 16th Party Congress, by Aleksandr Gerasimov (1930) / From Art and Power: Europe under the Dictators, 1930-1945, by Dawn Ades et. al. Judging by the shelves of food stores in Moscow and other Soviet cities, 1934 was a good year for the hungry and thirsty. 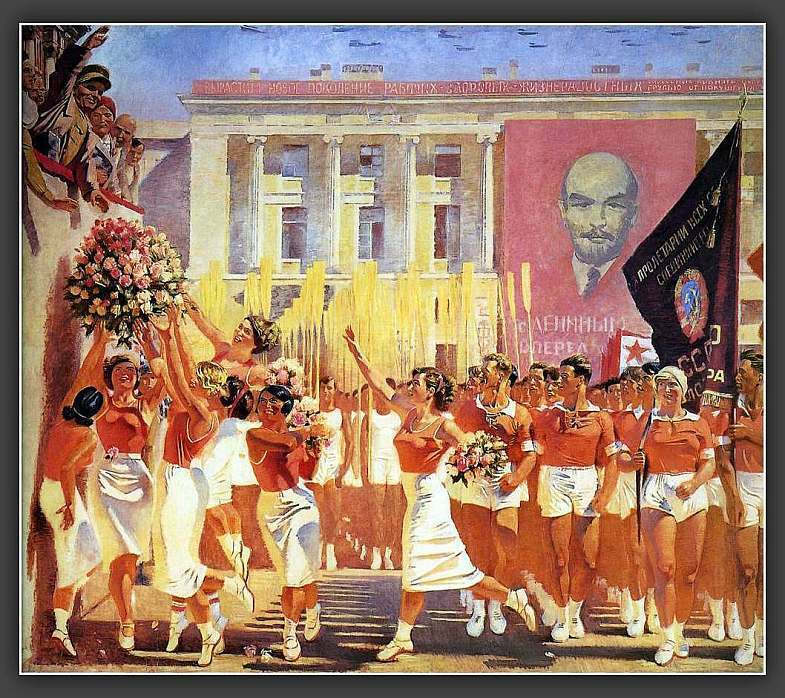 Only a few years after the terrible famine that gripped Ukraine and southern Russia in the wake of collectivization, and only a few years before the terror and war scare sent society into a tailspin, citizens experienced a period of relative comfort and well-being. 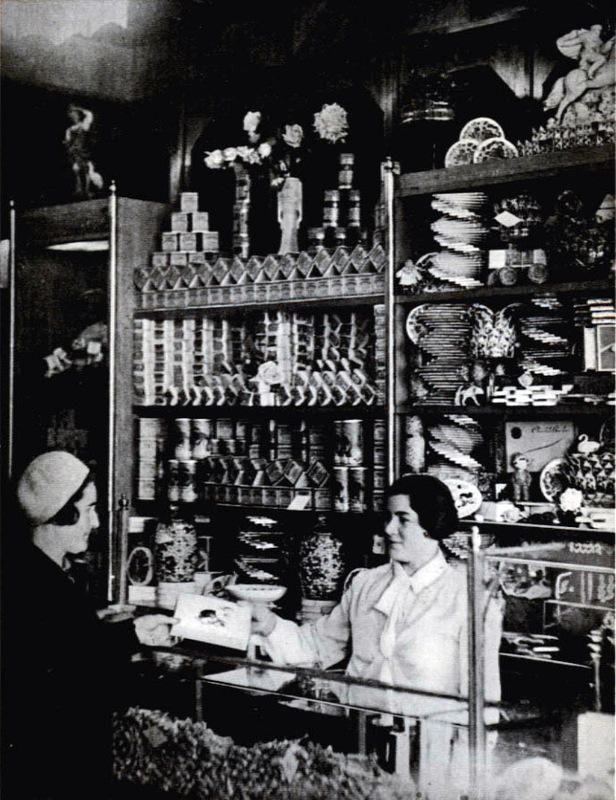 Consumer goods absent from the shelves for years reappeared; and food stuffs undreamed of returned. 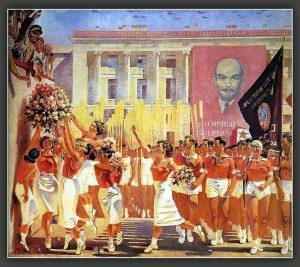 Perhaps most unanticipated in the proletarian paradise was the appearance of champagne, once the drink of aristocrats and later of NEPmen. 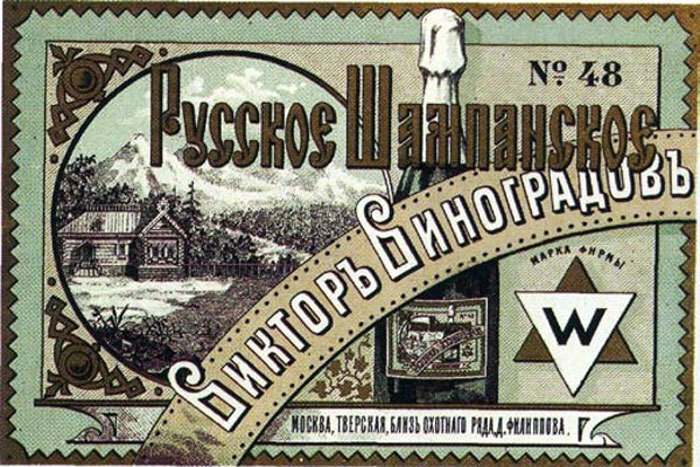 Russian champagne was a fairly recent invention, one still exotic when Revolution swept the country in 1917. 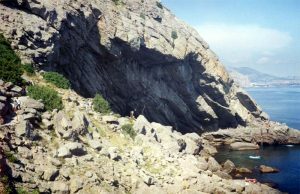 Two names are intimately connected with its birth. 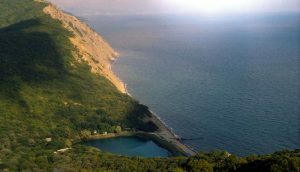 Prince Lev Golitsyn, once wine-master to the tsar, was founder of the magnificent New World wine estate on the Crimean coast before his death in 1915. This would be the site of Soviet champagne making efforts. Anton Mikhailovich Frolov-Bagreev, an aristocrat and chemist, was hired by the estate of Abrau-Diurso in 1905 to introduce the latest scientific methods into champagne production. 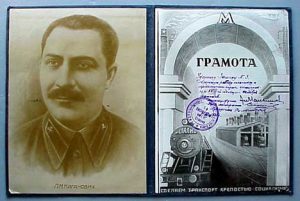 Although his participation in the revolution of 1905 led to Siberian exile, Frolov-Bagreev’s expertise proved so important for the fatherland that he was back in Crimea by 1906. His renown as a martyr of tsarism overrode his aristocratic birth for the Soviets, and he was returned to Abrau-Diurso in 1919 to become the chief oeneologist. 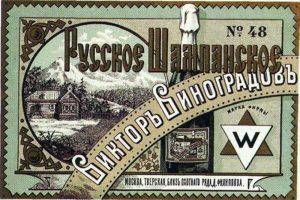 He spent the next fifteen years restoring Russian champagne to its previous (short-lived) glory. This entirely commendable goal endeared him to Soviet authorities, all the more so when in 1934 he developed a production system that allowed for fermentation of the champagne in reservoirs, rather than in bottles as before. 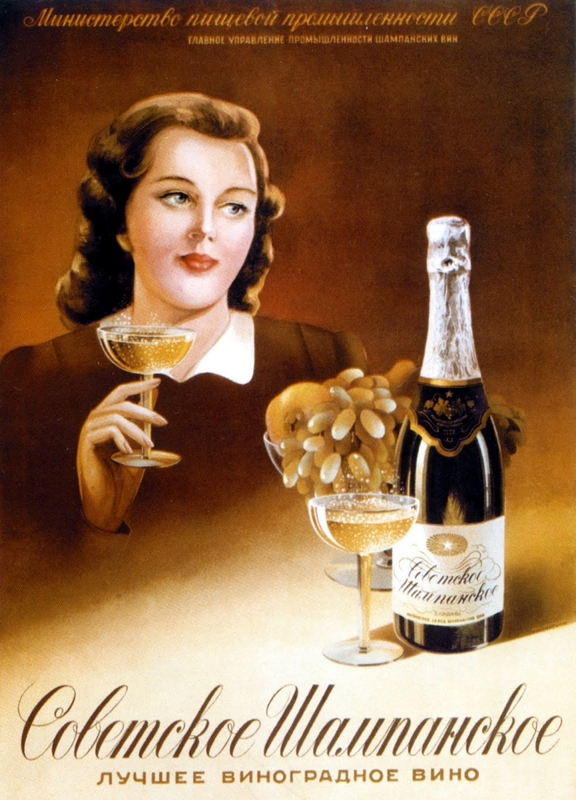 This allowed for mass production, making champagne a drink for the masses. From an initial level of 300,000 bottles per year, production rose to 12,000,000 by 1942, the depths of the war. 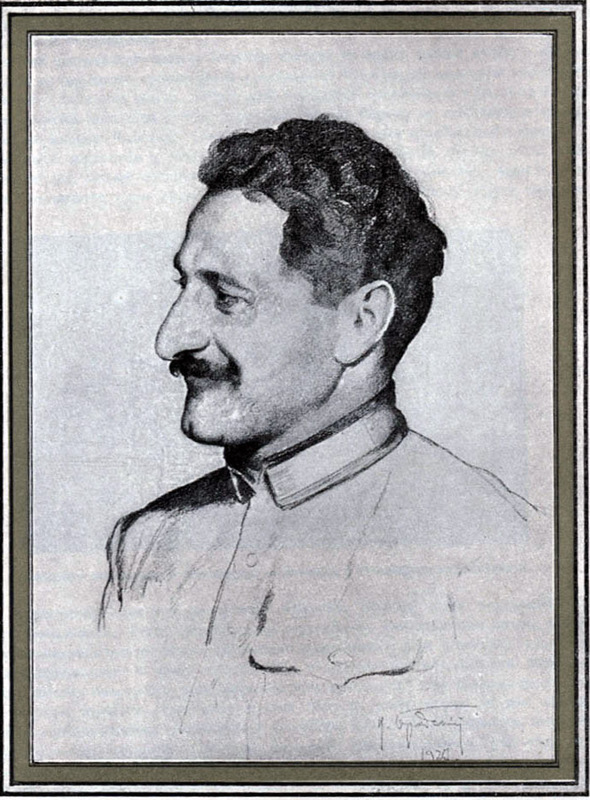 Anastas Mikoian, People’s Commissar of the Food Industry, helped Frolov attain his dream of popularizing the drink after the war. For several years, champagne was even sold on tap in food stores next to the fruit juices!